What is it? Mix a little Starship Troopers with a little Starcraft, throw in some area control, a dollop of asymmetry and a unique battle system. But is this dudes on a map game from Portal, well, a portal to success? You are juggling two oranges. No sweat, you’ve been doing this small parlour trick to amuse your daughters for years. Only it’s not just two oranges, it’s eight. And you’re on a unicycle. On a tight rope. Above water. Shark-infested water. And they’re not actually oranges, they’re hand-grenades. I imagine that’s what designing Cry Havoc might have been like. When you’re building a game from the ground up, its foundations struck deeply in the cement of asymmetry, balance is a far scarier prospect than any poltergeist. It’s hard enough when that asymmetry is a slow transformation, factions that begin on equal footing gradually changing their impact on the game – but when those factions are intrinsically different from the get go? If nailing that balance was enough to heap praise at the foot of Portal Games, they would be wading through the stuff. Job done, pack it up, we’re going home. Unfortunately, getting that balancing act just right is only one aspect of what makes for an enjoyable gaming experience and with so much focus on keeping those oranges and hand-grenades in the air, eyes fixed upon the sky, something as simple as an errant pebble can trip up even the most adroit of jugglers. Cry Havoc is certainly pleasing to the eye, but there’s also a genericism to the thematic direction that fails to provide the game with a strong sense of identity. It feels like a missed opportunity to imbue each of the games four factions with a spark of creativity that elevates them beyond the obvious comparisons. There’s absolutely no reason that the Human faction has to be well, human or that the machine army needs to be called the Machine Army. Perhaps this was a conscious decision, anything a little heavier on lore might narrow the appeal, but there’s a reason that games like Warmachine spend so much time and energy in fleshing out their worlds. I do like the art style though, and whilst the board does have its detractors I actually prefer the lack of finer detail. From the crafty manner in which the player boards all fit together to the sturdy miniatures quality, the components are excellent. At its core, Cry Havoc is a classic area control game. Regions are populated with Crystals of varying value – close your fingers around a region and hang on for dear life, and hope you outscore your opponents. If anything, and I’m lingering in controversial territory here, it has far more in common with a game like Inis than the Blood Rages or Kemets of the world. As with Inis, your actions are all driven by cardplay, whether it’s deploying troops, moving troops, building or activating structures, and they also share a similar tactical approach to battles. 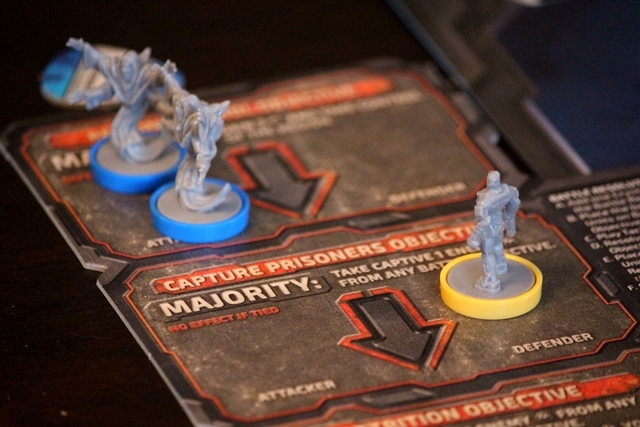 This territory specific tactic card can be used for Movement as indicated top left, or for the Battle action. What makes the action selection interesting, is that not only does each faction have a unique deck of cards, but each card potentially allows you a choice of different actions. Drop Troopers for example can be played to move one unit to one adjacent region, or to recruit 2 units or use 2 build points to either build or activate a structure. Although in reality, the only major difference between the faction decks is that they provide more of a particular point that faction specialises in. It’s the dilemma of which action to use a card for that provides the truly engaging decisions. What of the asymmetry I babbled on about for two paragraphs? Each of the four factions can construct unique structures, has access to unique Skills and most importantly requires a play style that varies from race to race. The Humans for example are able to spread very quickly across the map, the Machines are built on all-out aggression, the Pilgrims can generate points without having to go on the attack, and then we have the Trogs. The Trogs are native to the planet and numerous, whilst lacking in technological advancement they rely on overwhelming the enemy. They feature in every game, AI controlled at 2 or 3 players, but a force to be reckoned with in the hands of a 4th player. It’s here that we reach a major caveat – Cry Havoc requires a great deal of commitment to truly unlock the best the game has to offer. You’ll need a group where each player is committed to learning a specific race. The asymmetry only sings at the hand of an experienced player, and in order to nurture that experience, you’d need to play the same race multiple times. 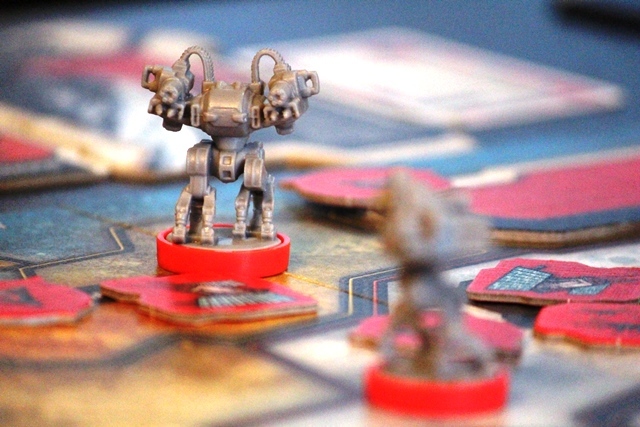 With the humans possessing a distinct advantage in a game involving new players, it’s not easy to convince a player in your group to play the Trogs often enough to master them when they will likely want to try out different races each game. And this isn’t a criticism – I appreciate the depth of gameplay that this approach presents, but it does have the consequence that you won’t see the best the game has to offer until perhaps the 3rd or 4th play. That’s not to say this can’t be enjoyed as a ‘play once every few months’, but you’ll likely find that it will always feel as if an element is missing. This is exacerbated by the unique racial skills – once you’ve mastered the default ability, in future games you can play with two additional skills, and not knowing the way these skills work in unison with your structures and overall playstyle is going to leave you at a disadvantage. 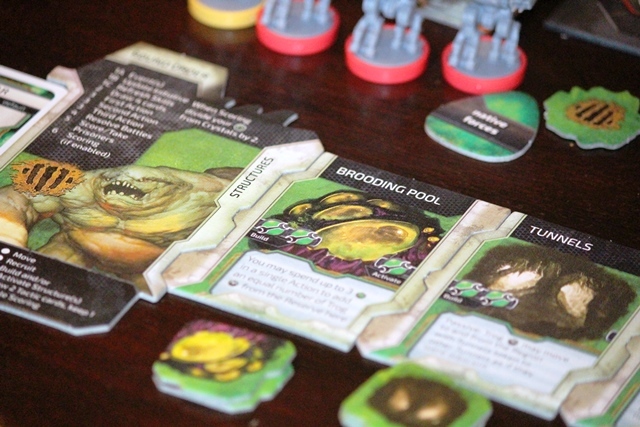 Prerelease, much of the hype was based around Cry Havoc’s combat system. Clashes result when an enemy factions enters an occupied area – pop a Battle token into the region to indicate that it’s in conflict, and at the end of the round all conflicts are resolved in the order in which they occurred. Enter the Battle Board, divided into three Objectives which translate into control of the region, capturing prisoners and killing units. The attacking players distributes their units involved in the clash amongst those objectives, then the defending player does the same. Players can then each play a Tactics card, alternating until both players either cannot or choose not to play further. Winning an objective is simply a case of achieving the majority – if you’ve got more units in the region control objective, you assume control of that region (ties go to the defender), take a single unit prisoner or kill off as many units as you have remaining in the Attrition objective. You can no doubt see why this mechanic had gamers excited, the cat and mouse nature of trying to second guess your opponent combined with the Tactics cards which allow you to do anything from switching out units after your opponent has placed theirs to placing additional units from other regions, you can never be quite certain how a particular battle may resolve. Unfortunately in practice, and with the massive disclaimer that my comments are based on a handful of plays and may well prove hopelessly inaccurate, those battles lack excitement. Since points are earned mainly on the number and nature of crystals in a region, there seems little incentive to aim for anything but region control. And whilst you do earn points for taking prisoners or killing units, those two objectives only ever seem to be consolation prizes. The Battle Board. The blue Pilgrims will win region control, but the yellow Human player will be able to imprison one Pligrim. Unfortunately where Cry Havoc stumbles somewhat is that in trying to provide sufficient tactical options for battles to feel more fleshed out, it introduces 4 additional decks of tactics cards that are region specific. If combat occurs in a specific region and you have a tactics card that matches the region, you essentially have an additional arrow in your quiver of options. And whilst these cards also provide extra options for moving and building etc, it feels like this aspect was slotted into the game to provide for some very light deck-building as an extra mechanic – I would have far preferred for some greater variance in the actual faction decks. 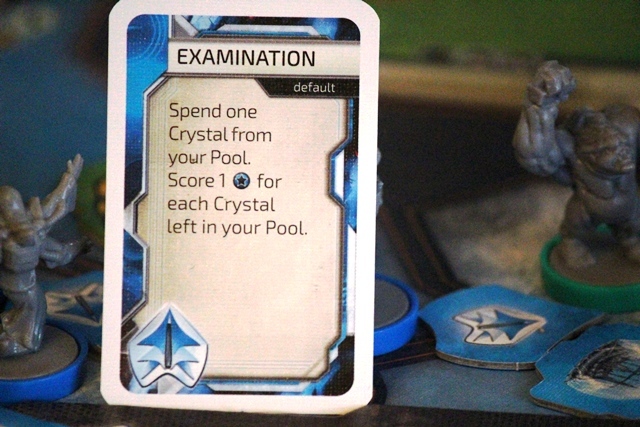 Scoring also has an unusual twist, in that as an action a player can Enable Scoring which simply means that at the end of the round, that player will score 1VP for every region they control in addition to everyone scoring 1VP for each crystal in every region they control (scoring for crystals is enforced at the end of the final round). The problem though is that the Enable Scoring action is a single card in each player’s faction deck, meaning you have to cycle through your deck until it pops out. And whilst the decks are thin enough that you certainly will see the card, I find it very odd that so much significance is placed upon a mechanic that is largely luck dependent. In reality, you’re likely talking about maybe 4 or 5 points in a game that typical sees final tallies in the +50 point region. It makes for some interesting decisions sure, but feels rather more like the first iteration of a novel concept that will likely prove far more engaging in a future game. The Pilgrim’s default special ability, marking them clearly as the turtling race. I know it seems as if I have been fairly critical of the game, and in truth I can’t say that it left a lasting impression. I’m all for games that require multiple playthroughs to unlock their greatness, but the hook needs to snag in the early running. 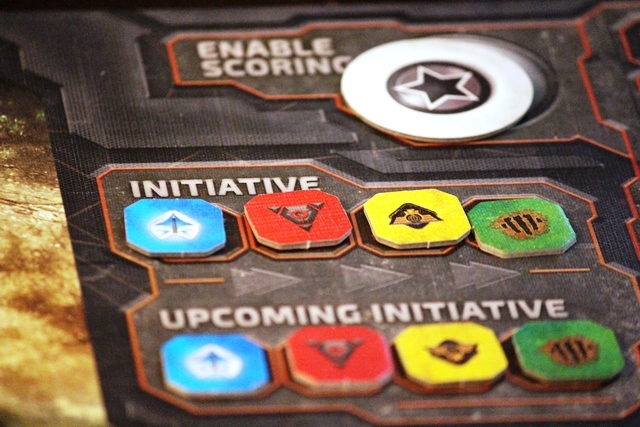 Having recently played Enthos, which Stuart will be reviewing soon, there are similarities between it and Cry Havoc from the perspective of needing to understand how the various factions operate. And while it may not be fair to compare the two, Ethnos’ clean and elegant design won me over in the first round. To put it in coding terms, whilst Cry Havoc’s code compiles without errors there are far too many if then clauses. There are interesting ideas showcased here, and for those willing to invest themselves in frequently visiting this world Portal have created I have no doubt will be rewarded. 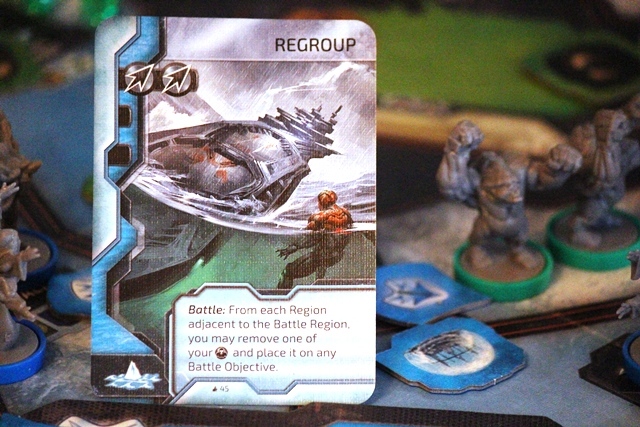 It’s perhaps telling that Cry Havoc may sometimes end prematurely if one player is too far ahead, and that even if it ends after the allotted five rounds that ending feels somewhat arbitrary – it’s a box full of potential innovation that promises much but in reality feels too constricted. I realise I’m very much in the minority on this, so I’d encourage you to read other reviews and perhaps watch a rules run-through or two before making your decision. Just as Cry Havoc begins to hit its stride, the game ends. The systems at play all gleam and shimmer in their own little boxes, but the picture that emerges once they all interlock loses much of that shine. I can see a rewarding experience deep beneath the ground, but I simply lack the desire or interest in dealing with the Trogs nest that stands in the way.